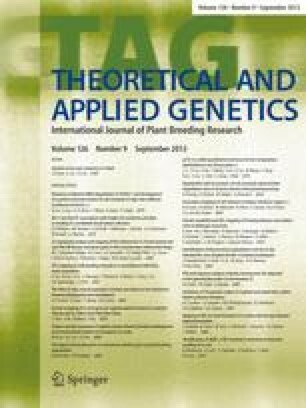 Clonal variation for rust resistance was studied in a factorial mating design of Populus trichocarpa and P. deltoides with 17 intraspecific and 15 interspecific progenies. Susceptibility to Melampsora larici-populina was assessed both under natural conditions in the nursery and after leaf-disk inoculation with two pathogen races in a controlled environment. Different components of the resistance were taken into account: immunity in the field or in the laboratory, latent period, number and size of uredia in the laboratory, and field resistance at the end of the growing season. Genes controlling immunity were contributed only by the P. deltoides parents. The distributions of clonal means within each family suggested a polygenic inheritance of field resistance in the P. trichocarpa x P. trichocarpa crosses, but major gene effects were suspected in the interspecific progenies. Inefficiency of the quantitative mechanisms of resistance in the interspecific F1 hybrids might have important implications for future breeding strategies. Field and laboratory trials complemented each other well, and a combined selection approach is proposed.